creature before his Creator. It exalts the greatness of the Lord who made us and the almighty power of the Savior who sets us free from evil. 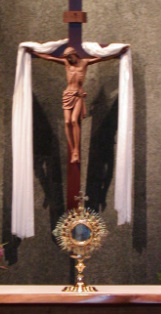 Adoration is homage of the spirit to the "King of Glory," respectful silence in the presence of the "ever greater" God. Adoration of the thrice-holy and sovereign God of love blends with humility and gives assurance to our supplications. As Catholics, we believe that Christ is truly and substantially present in the Eucharist. We give the Blessed Sacrament the same adoration and devotion that is accorded Christ. This can be done through visits to Christ present in the tabernacle or in the monstrance on the altar. Jesus desires an intimate friendship with each of us. Approach Him as you would a close friend, with love and respect, spending special time with each other and sharing the deepest joys, sadness, doubts or concerns in your heart. This time with Jesus will become a profound, peaceful and healing experience. Archbishop Fulton Sheen prepared his homilies in the presence of the Blessed Sacrament, as he put it, "The most brilliant ideas come from meeting God face to face." and the importance of it in their lives. when the sense of personal responsibility is diminished, then the door is open for the justification of injustices, for violence in all its forms, and for the manipulation of the many by the few. . . And so, it becomes all the more urgent to steep ourselves in the truth that comes from Christ, who is "the way, the truth and the life" and in the strength that he himself offers us through his Spirit. It is especially in the Eucharist that the power and the love of the Lord are given to us. Over 1,000,000 young people pray during Eucharistic adoration being led by Pope Benedict XVI at the World Youth Day prayer vigil in Madrid Aug. 20, 2011. Pilgrims endured 30 minutes of heavy rain during the vigil. "The time you spend with Jesus in the Blessed Sacrament is the best time you will spend on earth. Each moment that you spend with Jesus will deepen your union with Him and make your soul everlastingly more glorious and beautiful in Heaven, and will help bring about everlasting peace on earth." As we kneel before You, we recognize You as the Creator of all Life. We thank You and praise You for the lives you have given to us and to those we love. Give us a true and lasting respect for all life, for we recognize it as coming from You. whether that suffering and death has come as a result of abuse, war, gossip or abortion. We pray for an end for all disrespect of life. As we kneel before You, we ask You to forgive all those who do not respect the sanctity of life. the hands of a priest! under and ordinary piece of bread! therefore you became man for me. therefore you lived and died for me. therefore you rose again for me. therefore you went to prepare a place for me. therefore you came back to me. to enter into me and be united to me. This is the meaning of the Blessed Sacrament.